Soul and funk music has been an addiction my whole life since the mid 70’s, DJing at school discos which then esclated to mobile discoís then Clubs. I started my career in a small chain of dine and dance clubs in Surrey and Hampton Court. From there I worked in various larger clubs in South London and Romford from í89 to 2002 playing all kinds of dance and soul music etc. 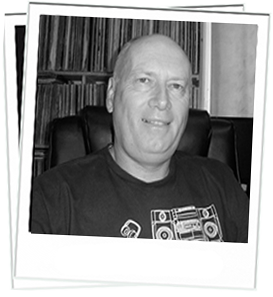 I also have worked on a local South London Radio Station called First Love while they had a temporary license playing soul and funk. The last thing I was involved with was an internet station called Flash FM intoducing and mixing funky house tracks which most had sampling from the 70’s and 80’s. Over the years I have spent more time in record shops than I can remember spending all my wages just to search for that certain 12inch or album track. My DJ influences are the usual suspects, Greg Edwards, Robbie Vincent, Jeff Young and Les Adams which to me have all been inspirational in giving soul and funk music the recognition it deserves. Favourite artists include Stevie Wonder, The Ojays, Frankie Beverly and Maze, The Whispers, Roy Ayres the list is endless. My move to this Station was by pure accident when I was surfing on the net late 2010. I sent an email to the station to say how good the music was. After 5 months of listening I met up with some of the RSR presenters on a soul night and then was asked to send in a demo. The rest is history and I would like to thank Dave Simons and Neil Winter for inviting me to be a part of this station. Also thanks to everyone involved with RSR in making me feel welcome. Your welcome to get in touch and share the passion.